I rarely eat pasta. I’m not entirely sure why, other than when I crave basic carbs, I just eat bread with some cheese or butter, even if I have to make the bread myself. And when I do eat pasta, I usually make myself Mac and Cheese, or some variant of it, because it is one of life’s ultimate comfort foods (the other two are soup and ice cream). 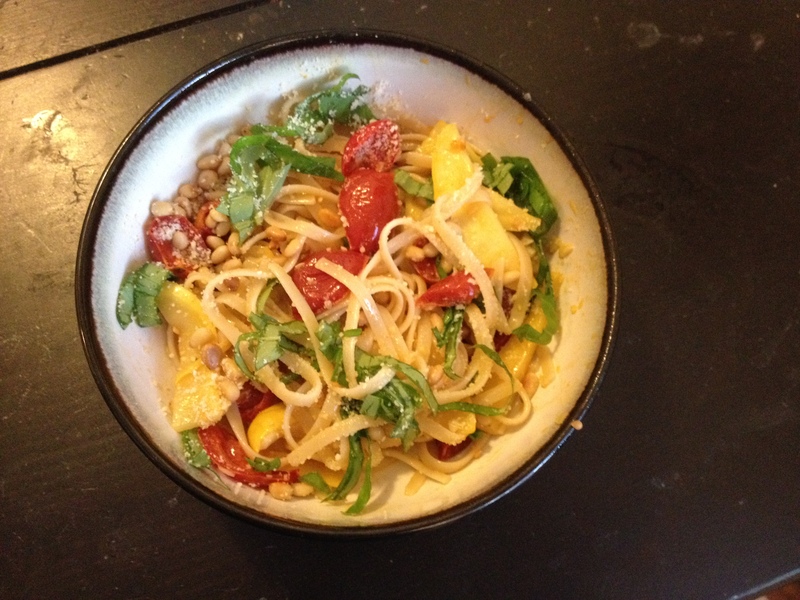 But, this week I decided to make an exception to that, and made pasta with summer vegetables. Cut the cherry tomatoes in half, toss with olive oil, and roast them. Now, roasting tomatoes can be done in a variety of different ways, I roasted them at 275 in the oven for about an hour and a half. Once they have roasted, set aside. Boil the pasta. In the meantime, saute the garlic and the squash in some olive oil. Add salt and pepper to taste. When they are almost done, add some white wine (like 2 tablespoons? – I just pour some directly from the bottle, rather than measure) and finish cooking. Then add the cherry tomatoes, pasta, and basil. Mix the whole thing together and make sure it’s heated through. Serve in bowls, then sprinkle with the pine nuts and parmesan. This was such a good recipe. Perfect for summer, and full of flavor, and not too complicated. Also, leave off the parmesan and its totally vegan. I’d love to say that I’d make this recipe again, but I doubt it, only because I never seem to make pasta! Ah well, maybe this will motivate me. Serve with white wine of course – whatever you cooked with. I used a torrontes, which is decent, but not my favorite varietal. Song of the Week: A Simple Desultory Philippic (or How I Was Robert McNamara’d into Submission) by Simon and Garfunkel. Way funkier than their normal stuff, but totally amazing and pretty much a string of references. It’s super 60s in the best possible way.